This is what happens when fluffy pancake blankets get cozy with a few sausage links and they go for a dip in a warm maple syrup bath. Good things happen, friends, very good things. First off, let me apologize for not posting a recipe last week! I am so sorry I’ve been slacking! Valentine’s Day came and went, (I’m still not engaged FYI) and life is suddenly crazy busy with a bunch of little things! And I feel like they just keep coming! The good news is, while I haven’t been blogging, I have been accomplishing things for Karlie and Oats! One cool thing is that there are officially business cards floating around the Denver Metro area with my name on them! I’ve been handing those things out like candy. Another thing I did was filed my taxes! Why is that significant, you ask? Well, with my tax refund I plan to revamp the blog! I’ve got a redesign planned, I’m working on getting a new camera, self-hosting talk is being thrown around…? AH! I am nervous…but stinkin’ excited, too. Keep checking back! BIG THINGS AHEAD! Meanwhile, back to this sticky, syrupy yumminess. 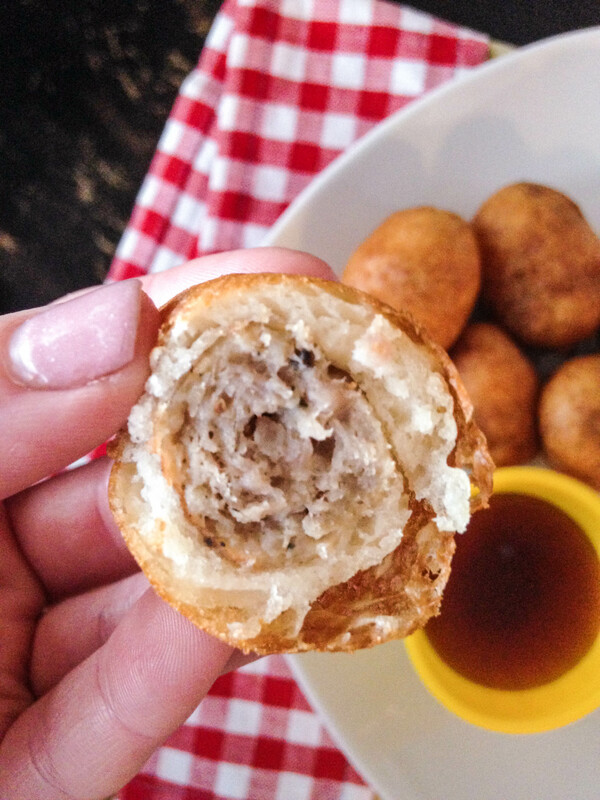 This little breakfast nugget is atop the high dive, suspended above a warm and sticky bowl of syrup. It looks like he is ready to take the plunge. 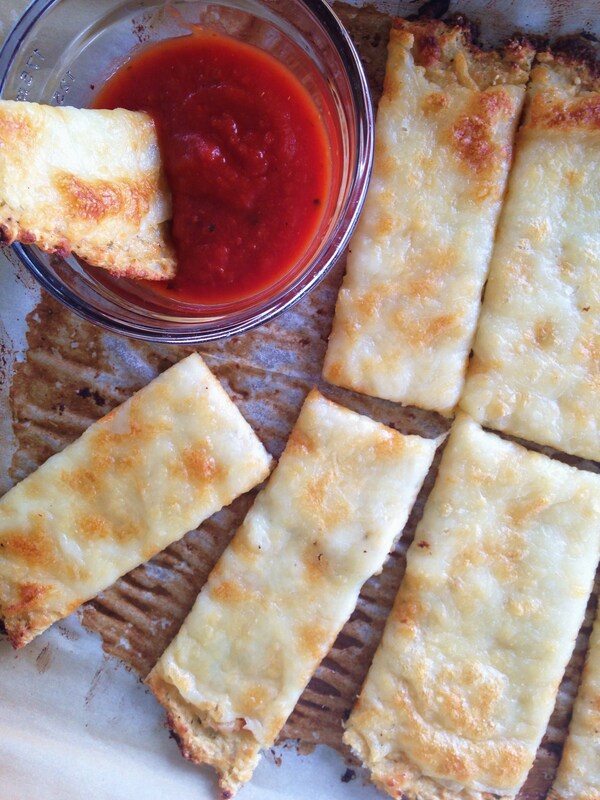 These little bites are so easy to make. Get out the sausage links, pull the pancake mix from the pantry, heat up a little oil, and put some syrup in a bowl. Cut, poke, dip, fry, and DUNK! Then you’re dunzo! Empty about 1 1/2 – 2 cups of dry pancake mix into a medium-sized bowl. Add small amounts of water to pancake mix and whisk together until mix has no lumps, just enough to thin it out slightly. Set aside. If sausage links are frozen, place in microwave for 1-2 minutes. Cut each sausage link in half (you should have 16 halves). 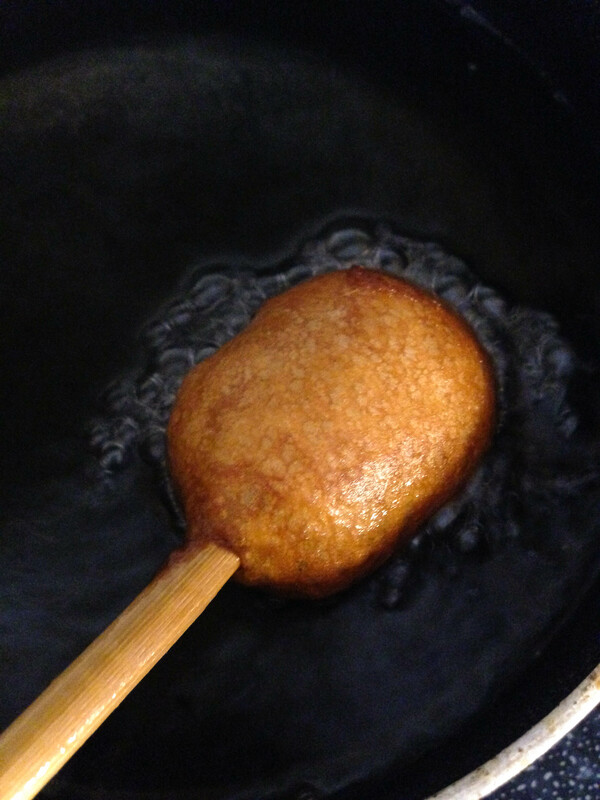 Press chopstick or skewer into one end of sausage link and dip sausage in pancake batter, coating evenly. 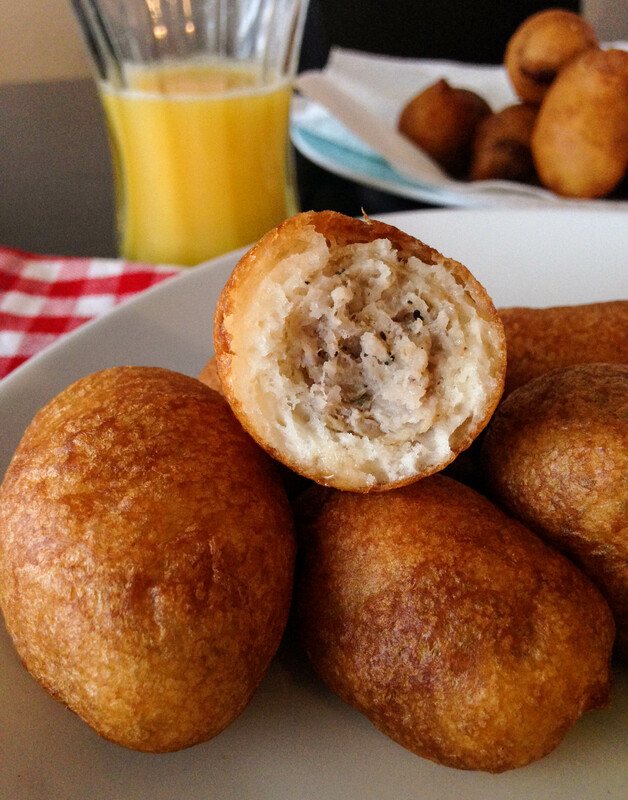 Repeat process with each little chunk of sausage. Serve all those mini bites alongside warm maple syrup for dunking. 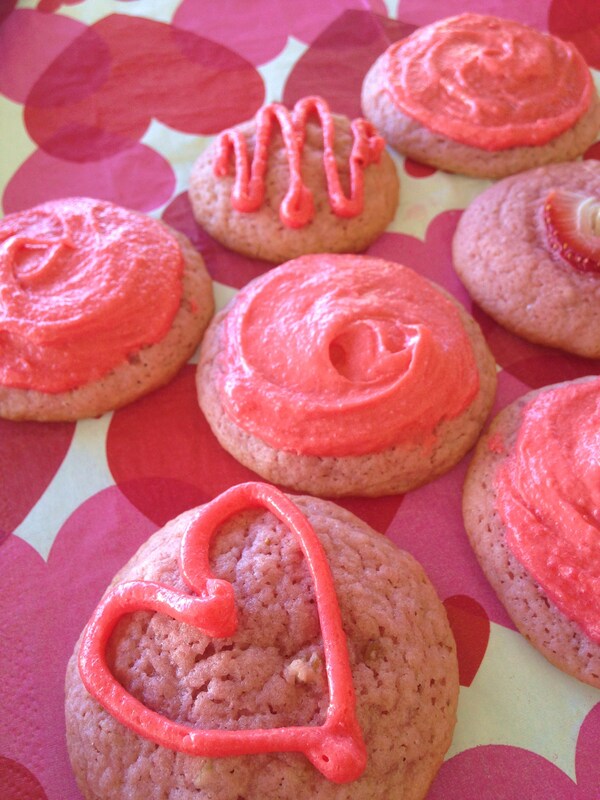 These bright pink cookies are made with REAL strawberries! They’re extra fluffy, super moist, and loaded with strawberry flavor. I don’t know if you noticed but…they’re PINK! These are the perfect treat for any pink occasion! So! Valentine’s Day is on Saturday! That’s exciting, right? Anybody else excited? I figured since love is in the air this time of year I would post a recipe for something that you might love. It is safe to say that I love these cookies, so I hope you do too. They are bright pink, which is kind of a funny color for a cookie, but they taste really good! Let me describe how they taste: let’s say you had a moist, fluffy, frosted strawberry cupcake in your hands. 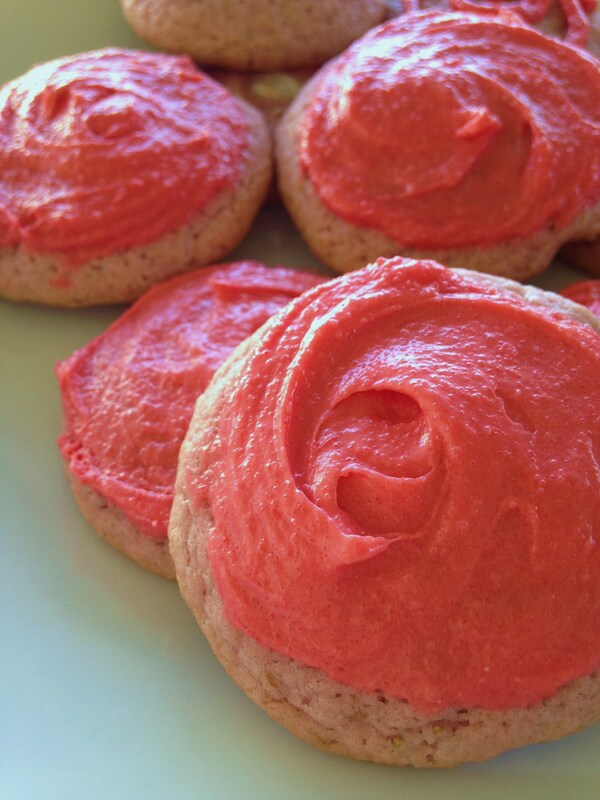 If you took that cupcake and flattened it in between your hands and shaped it into a round cookie, you would have a….mashed up, sticky, not-so-pretty strawberry cupcake cookie. However, it would still taste good! If you love the taste of strawberry cupcakes, but you’d prefer a sophisticated cookie over a messy cupcake, you will love this recipe! I have a confession. The only reason I’m beyond excited for Valentine’s Day this year is because I’ve convinced myself that my boyfriend is going to propose. I really shouldn’t get my hopes up, though. Any time we go out somewhere, I start to think it is going to happen. So it probably won’t happen. But I think about it all the time. It’s BAD. In a mixing bowl, cream butter and sugar with an electric mixer until fluffy. Add in pureed strawberries and mix until evenly blended. 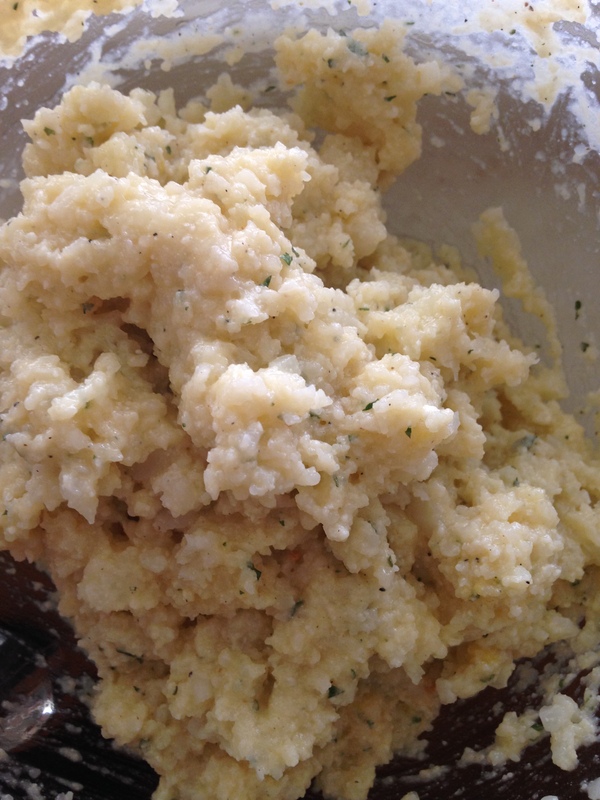 In a small bowl, mix together flour, salt, and baking soda with a fork. Stir in pecans and 5-10 drops of red food coloring to the dough if you’d like. 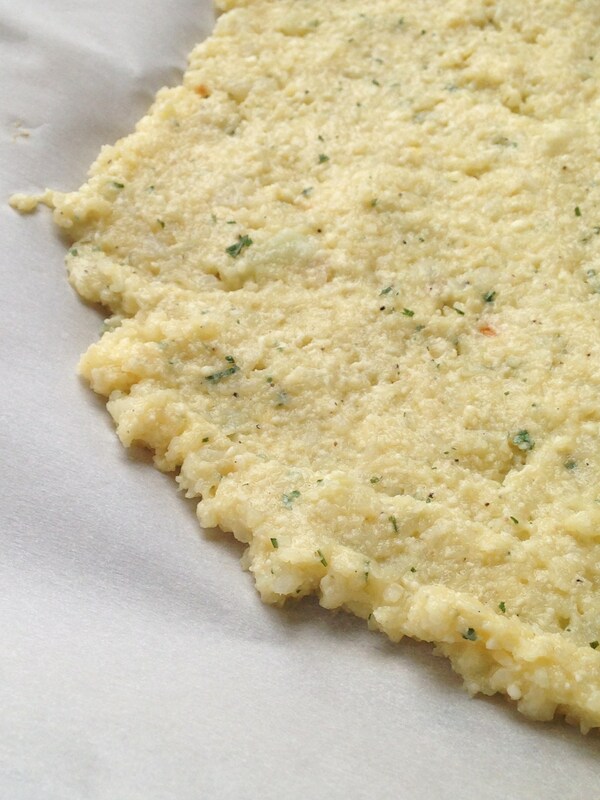 Drop tablespoonfuls onto greased cookie sheets and bake for 12-15 minutes at 350(F) until edges are slightly brown. 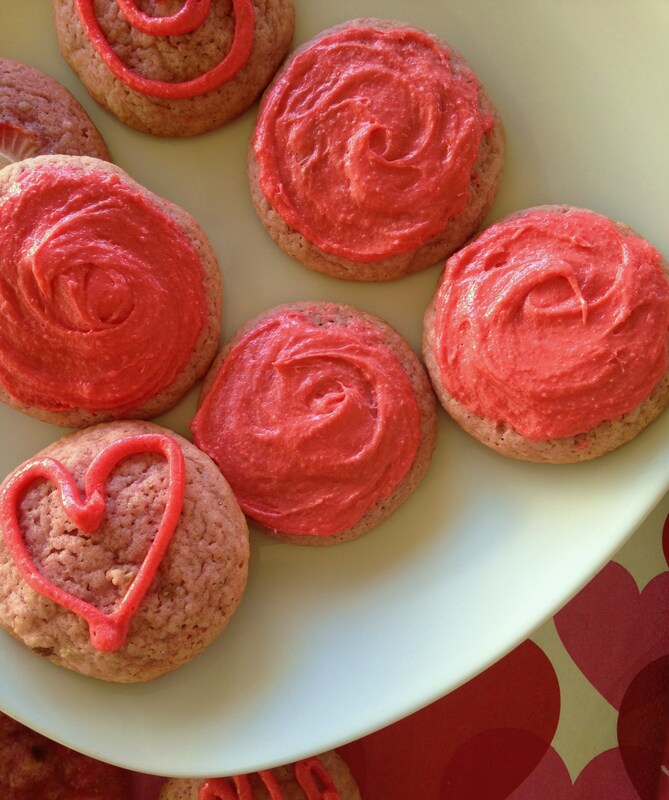 **While cookies are cooling, you can make a simple frosting! In a small bowl, blend together a block of cream cheese and a package of strawberry jello using an electric mixer. Beat powdered sugar into mixture and add drops of water until you reach desired frosting consistency. Frost cookies with a spoon, or place frosting in Ziploc bag, cut the corner, and decorate! NOTES** Frosting these cookies is the key to making them exceptionally moist! You can create just about any frosting you want. I frosted mine in several different ways and stored them in a sealed container and they stayed moist until they were all gone! I also tried rolling some dough up into plastic wrap (like a tube) and threw it into the freezer to bake later. This works just as well! It’s kind of like slice and bake cookies from there! If you tend to like a little less sweet, opt for no frosting, but keep these cookies sealed up in storage for moisture! Sprinkles make me SO happy! This recipe makes me happy too! 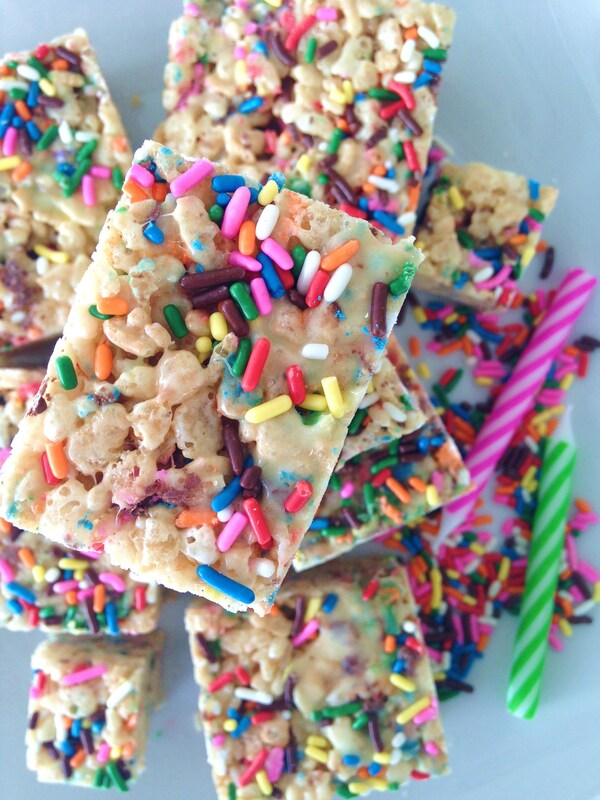 Easiest birthday treats ever! 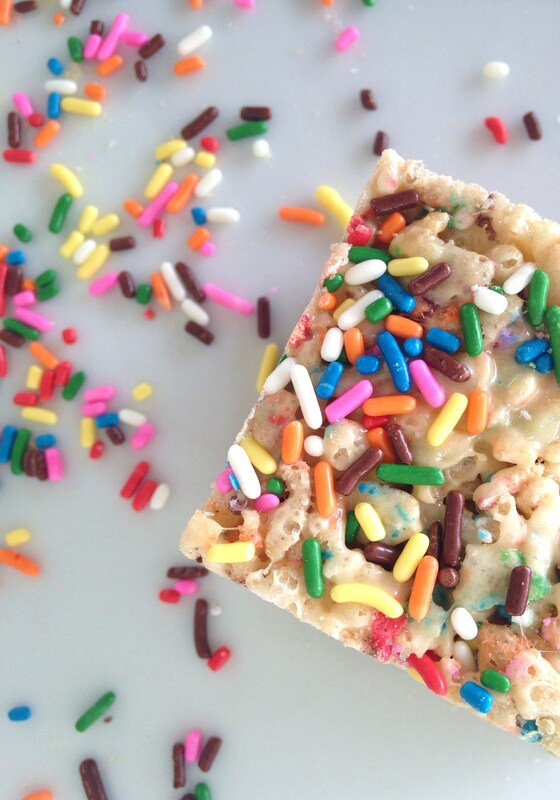 Cake mix + Rice Krispie Treats + SPRINKLES! HAPPY BIRTHDAY TO ME, HAPPY BIRTHDAY TO ME, HAPPY BIRTHDAY DEAR KARLIEEEEEE, HAPPY BIRTHDAY TO MEEEEE! Today is indeed my birthday! Hooray! I am officially 24 years old. Weird. The big 2-4. This is the first birthday I’ve had where I feel like I am actually getting older. 23 didn’t seem too bad last year, but 24…not sure how I feel about it. Birthdays. Gotta love ’em! Since it is my birthday, I thought it would be nice to share a fun little birthday treat recipe! It is pretty darn easy. 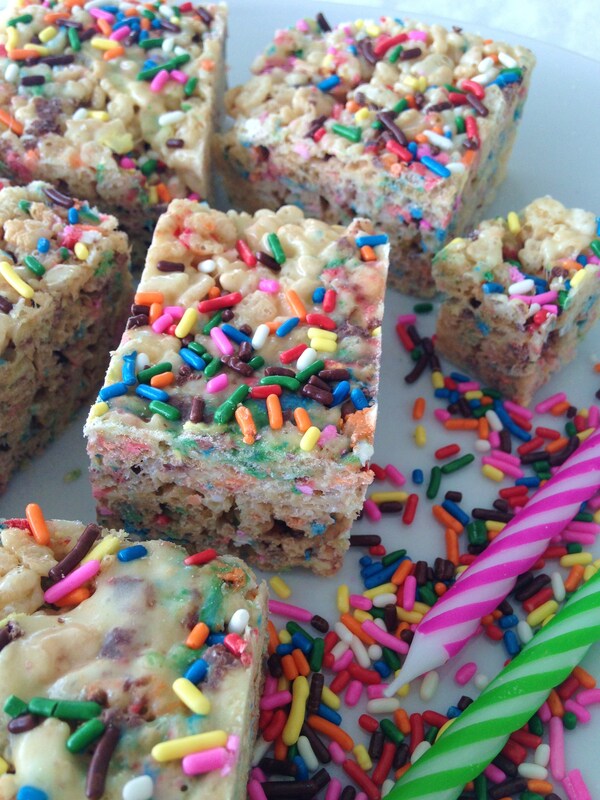 If you have ever made Rice Krispie Treats successfully, I will guarantee you can handle this one. It’s literally the same as making those, but you add one other ingredient to bring out the birthday flavor: cake mix! Tell me this picture doesn’t make you happy?! They’re chewy, gooey, marshmallow-y, and festive! 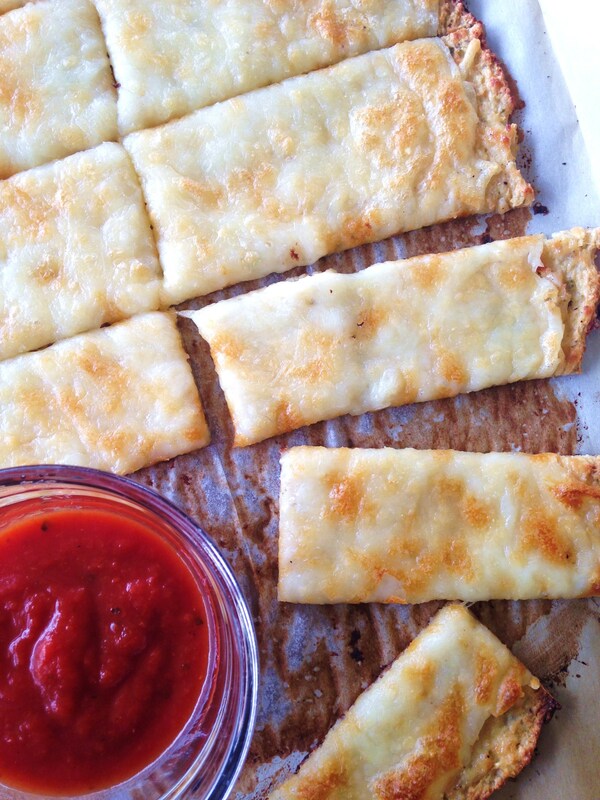 Any person at any age will appreciate this fun recipe! These treats are great, too, if you are in a hurry because you can whip them up in like 5 minutes. Grease a pan of your choice (8″x 8″, 11″x 7″, or 9″x 13″) and set aside. Over low heat on stove, melt butter in large saucepan. When butter is melted, add entire bag of marshmallows and stir constantly. 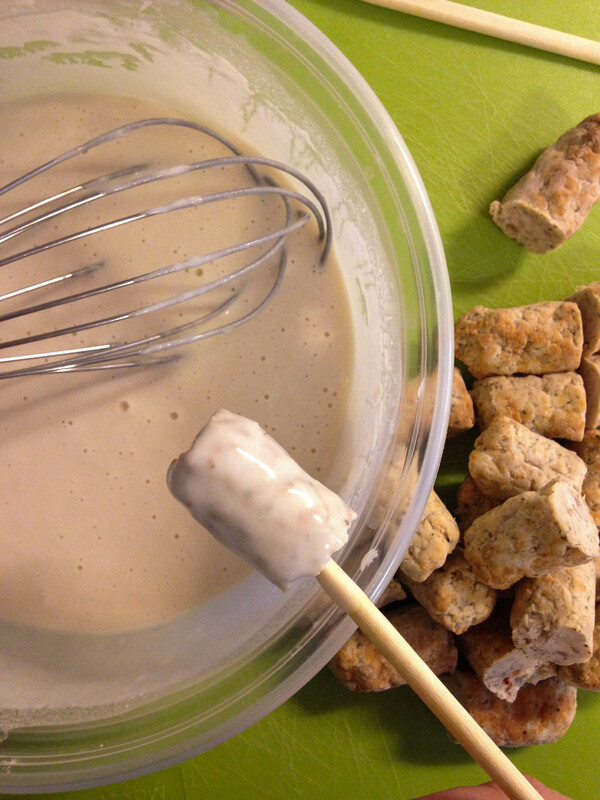 Stir in dry cake mix when marshmallows are completely melted. Remove from heat and mix in cereal. Press into greased pan and top with remaining sprinkles. 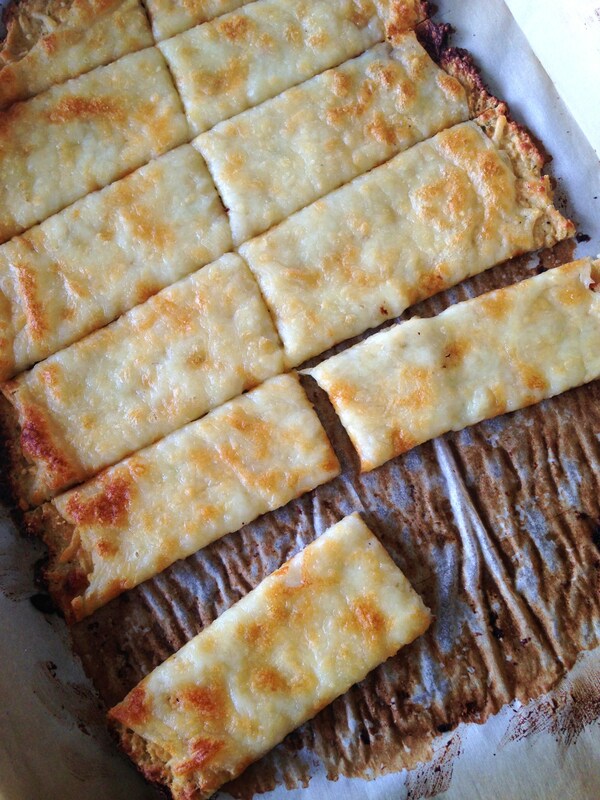 For firmer treats, let sit 30 minutes before cutting into squares.